Team Syachihoko - Check em' Out! What's to not like about this group! You've got really cute girls, add in some great melodies and BAM! you've got Team Syachihoko. 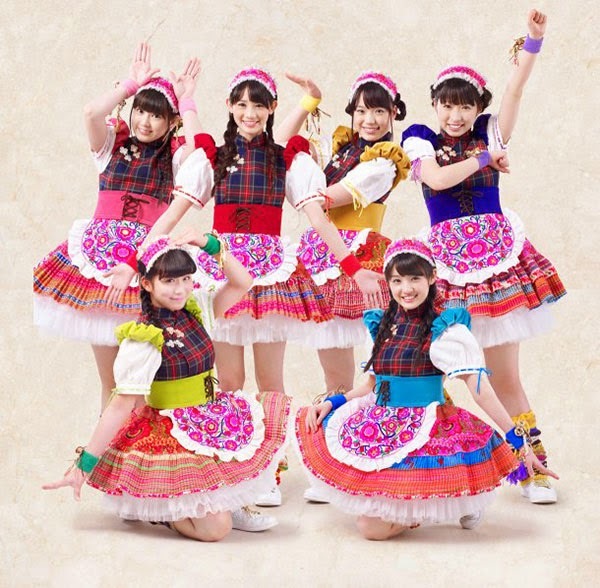 I first came across this group whenever I was looking at some Momoiro Clover Z songs, and became instantly a fan. As a matter of fact, Team Syachi, for short, is a sister group of Clover Z along with some other groups, but this is about Syachihoko. This group is color coded of course, which is no big deal to idol fans, even though it can be annoying. This group is from Nagoya, where they have their own show on the Nagoya PBS. Their music is so up-tempo that it seems to hype you up after listening to them. They are a group that you can go up to someone randomly and say "Look at what I found! ", and be amused. They all have talent for them in the future and I look forward to listening to them as well. I honestly hope they can come to the United States for a brief tour, Please? Their first full-length album Himatsubushi releases on August 20th. It has three versions you can purchase; Limited Edition, Limited Edition w/DVD or Limited Edition w/ a book Teaching Dance. I'm not sure which one to purchase but I'm leaning toward the one with the book. The one from HMV comes with a clear folder but both come with an application ticket for extra content. The video I posted will be in their new album and it has become my favorite song. I like the video because not only does it include a bit of live scenes but it is also a BTS-video.